Once we got there, we ordered some steps, the house bags o’ mystery, and, against my better judgment, a few fourpenny cannons. Of course, pints of foot-rot were quickly acquired. In 2016, much of the passage above might not make sense. And for good reason: it was sprinkled with slang from the Victorian era (late 19th century, early 20th century). Once we got there, we ordered some steps (thick slices of buttered bread stacked on the plate to look like steps), the house bags o’ mystery (sausages), and, against my better judgment, a few fourpenny cannons (low-priced beef-steak puddings). Of course, pints of foot-rot (low quality ale) were quickly acquired. These slang terms are all from a book published in 1909 called Passing English of the Victorian Era: A Dictionary of Heterodox English, Slang, and Phrase, which I learned about from The Public Domain Review’s Twitter feed (@publicdomainrev). Fourpenny cannon (London Slums). Beef-steak pudding price, a groat. Named possibly from its shape, that of a cannon-ball (cut down to cannon), but possibly referring to the cast-iron character not only of the beef, but its integument. Mops and brooms (Peoples’). Drunk probably suggested by the hair getting disordered and like a mop. From a time when hair was worn long. ‘ Mops and brooms ‘ doubtless express a sense of confusion. Daily News. Muck and halfpenny afters (Middle Class). Bad, pretentious dinner spotted at the corners with custard powder preparations, and half-dozens of stewed prunes, etc., etc. Copper-rattle (Navy) . Irish, generally Irish, or other stew from the hubble-bubble of this boiling delicacy called in London city restaurants, ‘French Pie’. Spotted dog (Street Boys’). Plain plum-pudding spotted dough. The dog here is one of the pronunciations of dough the ‘h’ being removed and the ‘ g ‘ made hard. Liqueur of four ale (City, satirical). 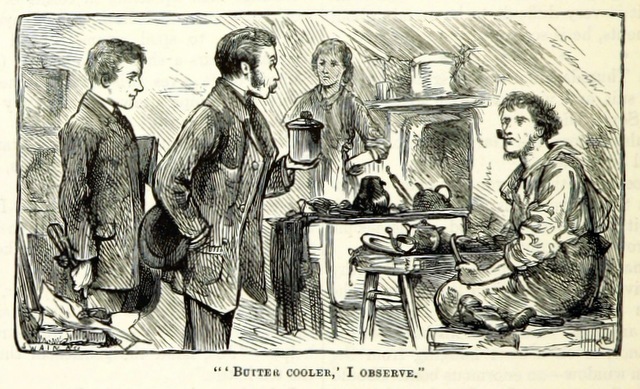 Precisely as the common folk make fun of cheap food and give it impressive titles such as calling sheep’s head broth turtle soup ; so middle – class young city men chaff their drinks. The most expensive liqueur, green Chartreuse would be eighteenpence while four ale (City sherry) is the cheapest. Phrase really means, *a glass of bitter’ beer understood. Clove-hunters (Amer.- Eng.} Frequent nip-drinkers, especially between the acts of a play, when the nibbled clove vainly sought to hide the higher perfume of the alcohol. Came to be used (1884) for the refreshment itself. Call it 8 Bells (Nautical). Early drink. It is not etiquette in good nautical circles to have a drink before high noon ; 8 Bells. So the apology for alcoholics before that hour takes this form : ‘Come along I fancy the bar is this way. Call it 8 Bells.’ And they do. Beer and Skittles (Peoples’). A synonym for pleasure; e.g., ‘Ah, Joe, if a bloke’s life was all beer and skittles we shouldn’t be doing time.’ [Example:] But life on a yacht is not all beer and skittles, nor is it always afternoon. There is the dreadful morning time, when the crew begin to stir on deck, and earthquake and chaos seem to have come. D. N., 22nd August 1885. 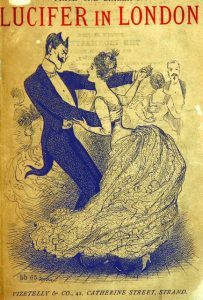 Forever-gentleman (Soc., 1870). A man in whom good breeding is ingrained. 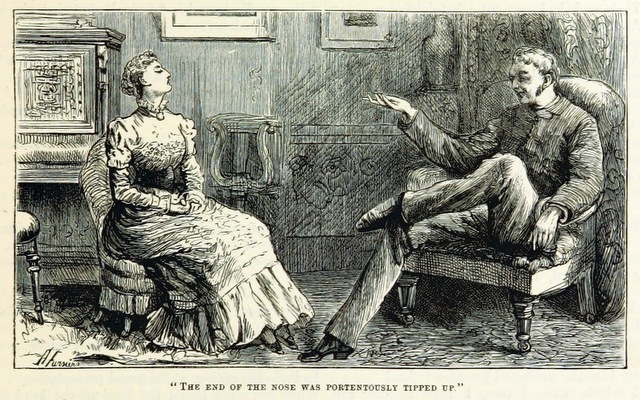 Half -hour gentleman (Soc., 1870). A man whose breeding is only superficial. Popsy wopsy (Low. Lond.). A smiling, doll-like, attractive girl. Talk to his picture (Suffolk Peoples’). Admonish so gravely that the admonished one will be no more able to speak than could his portrait. Sally B. (American, 1880 on). A very thin, tall woman in evening dress. This phrase, which fleetingly passed through London, is quite historical. 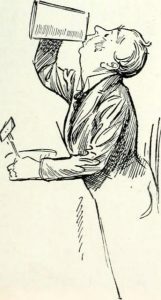 Derived from Madame Bernhardt, who, though at the end of the Victorian era, she became a well-developed comedian, was for many years the most absolutely thin woman on the stage. Bumble puppy (Provincial). A tossing game used to cheat simpletons hence bumble-puppy means idiot and idiocy. Origin unknown. Wig-faker (Low. London, 18 cent. on). Hair-dresser. Passing English of the Victorian Era: A Dictionary of Heterodox English, Slang, and Phrase, by J. Bedding Ware, published by George Routledge & Sons, Limited (London) and E. P. Dutton & Co. (new york), 1909. Full text provided by Archive.org. Contributed by the University of Toronto. All from the British Library’s Flickr Commons Collection, no known copyright restrictions. 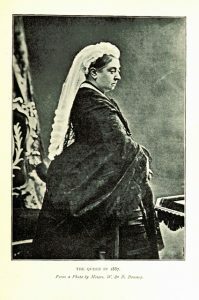 Queen Victoria in 1887, from page 195 of The Victorian Era, etc. “Crony” is still widely in current use. “Beer and Skittles” is less common, but I’ve heard it. Whenever I see crony today it is paired with capitalism to give it a negative connotation, e.g., ‘that factory deal was just another example of crony capitalism, where back-room deals enrich the powerful…’ Perhaps outside of the political and economic sphere, or outside of the U.S., the word has a less negative reputation.